Because of their low cost, vinyl windows have become the dominant product in both the new construction and replacement markets. (Although I am amazed at how much some companies are charging for their vinyl windows today!). Many companies also do offer good warranties with their replacement windows. However, if you are purchasing windows, as is so often the case with most products, the lowest price isn’t always the best value. While most vinyl windows are great when they’re brand new, we have learned from our experience that they are much more susceptibl e to some long-term problems that often begin to appear after about 8-10 years or less. Some of the problems we’ve seen have included seal failure which leads to fogging between the glass, and expansion and contraction leading to air infiltration in and around the window itself. Expansion and contraction may also prevent the window from opening and closing properly. Another concern with vinyl windows that most people don’t realize until it’s too late is related to their lack of strength. To make their windows strong enough to support glass and operate properly, vinyl window manufacturers need to make the frames of their windows unusually wide. This means a loss of visible glass space. We have heard from quite a few consumers saying they were disappointed with how much smaller their new vinyl replacement windows are compared to what they had. Another factor we’ve observed is that vinyl windows have become more and more of a commodity. For the last 10 years, we have seen an increasing number of vinyl window companies come and go through bankruptcy, buy-outs, mergers, etc. Many of these companies don’t even manufacture their own windows but pay someone else to do it for them and then put their company label on them. The warranties offered are only as good as the company that offers them and if you are looking to buy vinyl replacement windows, there is a great possibility that in 10 years the company you bought them from won’t be around to honor the “lifetime” warranty they sold you. 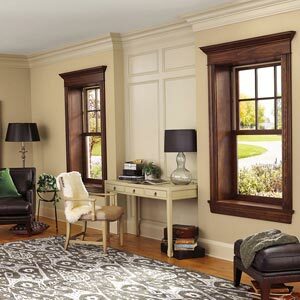 A great alternative to vinyl windows that we’ve found is a fiberglass unit. Fiberglass is exceptionally strong. As a matter of fact, the “Integrity by Marvin” product that we prefer uses a fiberglass called “Ultrex” that is 2X stronger than steel. This fiberglass is the same kind of material used to build things like boats and ladders … and you’ll never see a vinyl ladder. This means that you’re buying a window that has a narrow frame so you don’t lose glass space, and will keep its’ shape so that it will operate as well in year 20 as it did when it was brand new. It is also much less vulnerable to the air infiltration issues that plague vinyl units. Moreover, considering fiberglass is virtually as stable as glass, the problem with fogging between the glass is almost non-existent. We also prefer the “Integrity by Marvin” unit because its’ warranty is backed by the Marvin Company. Marvin is a family owned company and has been in business for over a hundred years, so on the rare occasion that you would have a problem there is a solid company standing behind the product. Typically (but not always) you’ll spend more to buy a fiberglass window. Nonetheless, we have discovered that the product is more than worth the additional cost, making it an excellent value. If your budget simply doesn’t allow for the extra cost, make sure that you buy the best vinyl replacement window that you can afford and, if possible, buy a product manufactured by a company that’s been making their own windows for a long time. If you would like more information, please feel free to contact us at 717-733-9142.